Runway2Reality.com is proud to announce the availability of its application for Nokia phones. This free app, available worldwide from Nokia OVI Store, displays the latest fashions from the runways of Manila, New York, Paris, Milan and London in an amazing speed onto a user's mobile device. Fashion people around the globe will now be able to view the latest runway shows from Philippine Fashion Week, US and Europe in the plam of their hand just hours after they happen. Runway2Reality.com has always been about fashion and style meets techonology, and this new OVI application will let us deliver that commitment. 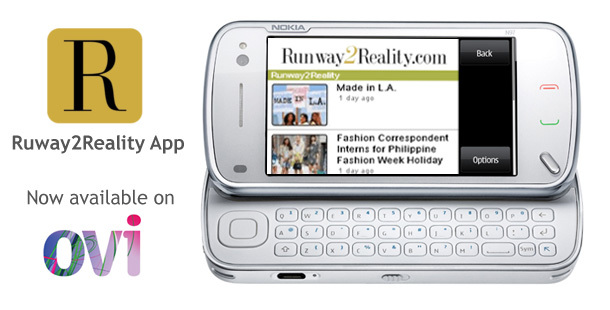 Runway2Reality.com would like to thank Nokia OVI for the development of the app.